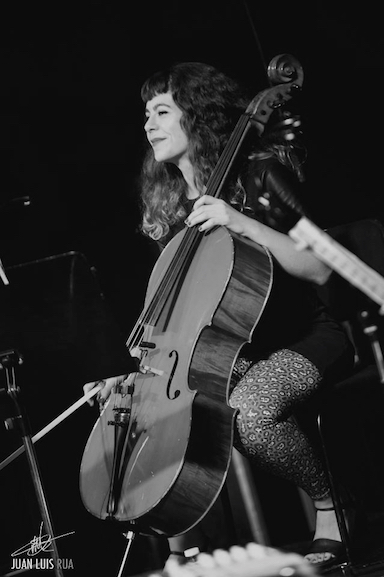 Multidisciplinary artist, cellist, performer born in Spain in 1982, Macarena is graduated at the school of fine arts, with a master in contemporary art at Pontevedra’s faculty. Musician with a classical formation, later specialized in jazz, she's currently involved in free improvisation. In the early 2000s she joins the folk band Avalon, publishing with them 2 records and taking part in national radio concerts, among others. She's one of the founder of both 23RedAnts and Suelen Estar Quartet and a member of OMEGa (Orchestra de Musica Espontanea de Galicia) and she has published several works in both digital and analogue format beside plays in different independent festivals. She also worked for some theatrical and ballet projects like, for instance, “Nielheim” by Monica Garcia, “Ulises, a nena durmida” by Anxela Blanco or, in collaboration with the Tanzhaus in Zurich, “LP4am” by Mercé de Rande and she’s the creator, with Licenciada Sotelo, of the shows “Silencio por Favor” and “Ensayo Amor” and a partner in some performances by Maria Roja, Alba Blanco and Idoia Zabaleta. Besides his work as musician and performer she’s teaching cello in two schools in Vigo, Galicia.